Australian scientists have urged greater consideration for the brilliantly-hued parrot fishes that tend and renew the world’s imperilled coral reefs. Scientists says the activity of these small parrotfishes (and other reef cleaners) are the possibly the main explanation why many coral reefs around the world subject to heavy human pressures have not yet collapsed. 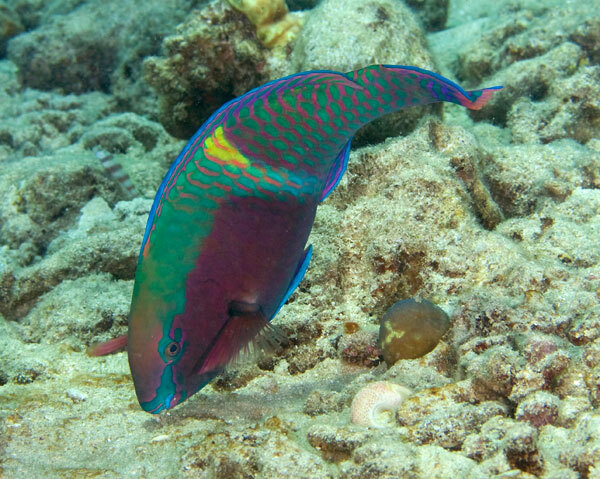 Parrot fish fulfill a number of key roles on the reef. They remove sick and dead corals and clean areas for new corals to settle, they remove weedy growth, and they cart away literally tons of sand and sediment that would otherwise smother the corals. While the smaller parrotfish are indeed resilient, it is nevertheless vital not to overfish them because of the role they perform in helping reefs regenerate, he cautions. Larger parrotfish have already suffered extensively from heavy targeting by spear fishers. stocks on the five most heavily fished reefs,” the team says in their report.